TV On The Radio Brought Out Miguel In L.A.
For a live cross-genre collaboration. 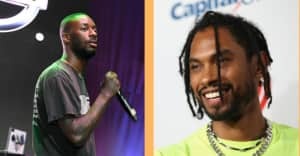 Over the weekend, Miguel joined TVOTR on stage for a rendition of his single "Adorn" and a cover of Can's "Vitamin C." It's not much of a stretch for Miguel to work in this format: his music leans more towards rock than any other R&B singer's. He strutted and jumped around the stage, leading the crowd in a call and response. He also made an appearance towards the end of "Seeds" to sing along with TVOTR's lead vocalist, Tunde Adebimpe. Revisit TVOTR's FADER cover story.